Two boats sit quietly in a harbor on the island of Nova Scotia. The overcast day lends a muted quality to this painting which is set off by the bright colors of the boat house and the red boat. In the lower right hand corner, a few lobster pots stand ready for the next time they will be needed. 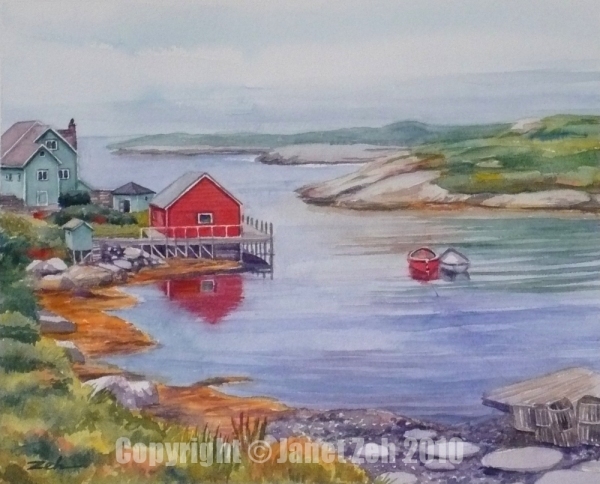 The original has been sold, but you can find more of my seascapes in my Original Art Shop. Thanks for stopping by today!